Geothermal power plant produces electricity by using geothermal energy. High temperature water or steam is collected from geothermal reservoir underneath earth surface and is used to spin a turbine to produce electricity. They can then send the produced electricity via power lines to far away users. Currently United States leads the world in generating geothermal power. According to the Energy Information administration, geothermal power plants in the united states produced 15.2 billion kilowatt-hours of electricity in 2009. As of 2010, 24 countries around the world use geothermal power to generate electricity. (Source: Geothermal Power by Carla Mooney, 2012). The other user of geothermal power are Philippines, Indonesia, Mexico, Italy, Japan, New Zealand and Iceland. Dry Steam Power Plants is the oldest and simplest of all that directly uses the geothermal steam of 150°C or greater to spin the rotor of a turbine. The turbine is connected to a generator for producing electricity. The produced electricity can be distributed via electrical grid. Flash Steam Power Plants collects high pressure hot water from deep beneath and store that in a low-pressure tank. Then they use the resulting flashed steam to drive a turbine for producing electricity. The pulled up hot fluid temperature should be at least 180 0C or more. Binary Cycle Power Plants uses moderately hot fluid (below 200 0C) to heat a secondary fluid with much lower boiling point via heat exchanger. Then uses the secondary fluid to flash vaporizes to drive a turbine. The cooled secondary fluid flows back to the heat exchanger and heats up again. This type of plant is a recent development and most common type of plant being constructed today. Enhanced Geothermal Systems of Engineer Geothermal Systems (EGS) are referred as future of geothermal energy. 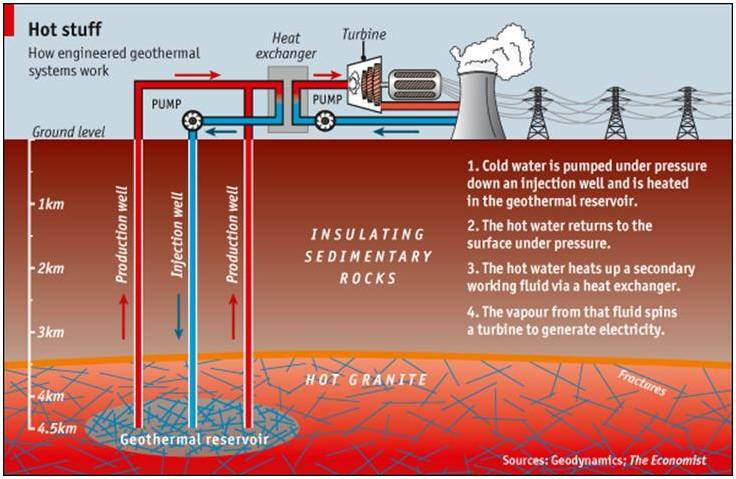 In this type of system an artificial geothermal reservoir is created inside hot rocks by drilling deep down (at least 3 to 10 kilometers). Deep down earth core is made of hot dry rock. Then cold water is injected into that in a very high pressure. Cold water breaks down solid hot rock and creates an artificial reservoir. The water gets hot from contact with the surrounding hot rocks. This water is then brought up using additional drill to run a binary cycle power plant. Theoretically, EGS can expand the reach of geothermal power enormously and provide access to an inexhaustible energy source (Hot Rocks and High Hopes, The Economist, Sept 2, 2010). The plant is located in the volcanic part of northern Italy. The plant was built in 1911and is running for more than 100 hundred yeas. Although the underground reservoir had dropped 30% from their peak, still about 1 million homes get their electricity from this plant (www.reuk.co.uk). The Geysers, in the north of San Francisco, California; is the worlds largest geothermal energy operation. There eighteen power plants produce 850 megawatts of electricity annually – it generates enough electricity to power a city the size of San Francisco. The Geysers completed its fiftieth anniversary in 2010 and is expected to be around for another fifty year. (Source: Source: Geothermal Power by Carla Mooney, 2012). 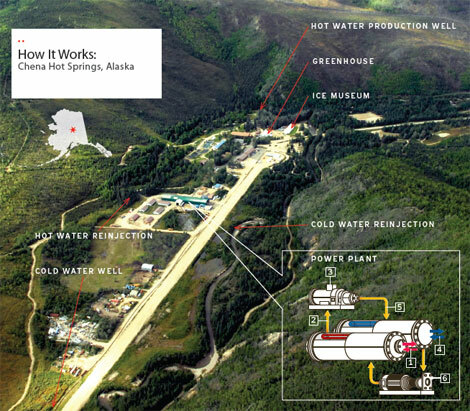 The geothermal power plant near Fairbanks, Alaska is the first geothermal plant in Alaska and it is producing electricity from lower temperature water than any plant in the world. This power plant heats the Chena Hot Springs Resort buildings, maintains a greenhouse and keeps the Aurora ice museum frozen year-round. The Olkaria power plant in Kenya, Africa is operating since 1980s. Olkaria II Power Station is one of Africa’s largest Geothermal Power Station and It generates 70MW. 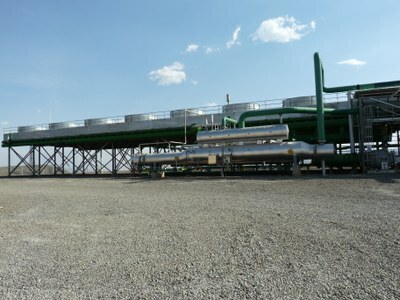 The Power Station is located in the North-Eastern sector of the greater Olkaria geothermal field.